We understand that, by the time you are reading this tidbit, that Giselle Grynbaum would have already left the BDAV. Our small team at Clause 1 would like to say a heartfelt farewell to Giselle. 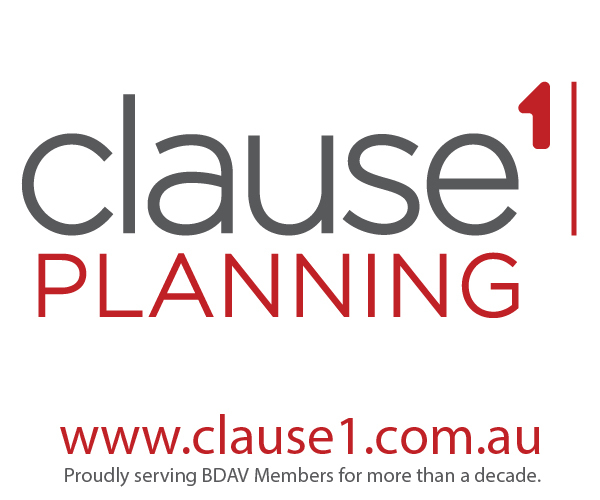 Giselle has represented the BDAV with the utmost integrity and professionalism in all of her dealings with Clause 1, since we were first introduced more than 11 years ago. We sincerely hope whatever endeavours come next are enriching and thank you sincerely for all your support and hard work. – 2 or more bedroom dwelling: minimum width 3.6 metres, minimum area 12 sqm. – The minimum width of the living area is the smaller of the two dimensions of that area. For example, where a living area is a rectangular shape of 3.3 x 3 metres, the 3 metres dimension will be taken as the width (irrespective of the way in which the living area is oriented within the open plan area). In this case, the applicant had shown the dimensions and area of the ‘living area’ within each apartment. Many of them did not meet the minimum dimensions of the standard. Glen Waverley Activity Centre, whereas the zone and local planning policies sought to treat the site in the same manner as other residential neighbourhoods, far removed from an activity centre. There were three preferred character statements applying to the site, all seeking to achieve very different character outcomes: one being part of current planning policy, one part of the Monash Housing Strategy and one part of a Planning Scheme Amendment before the Minister for a decision. – The other two character statements provided generalised preferred character statements that applied to all residential land within the municipality. The Tribunal found these did not make sense and nor did they assist in decision making in activity centre locations.